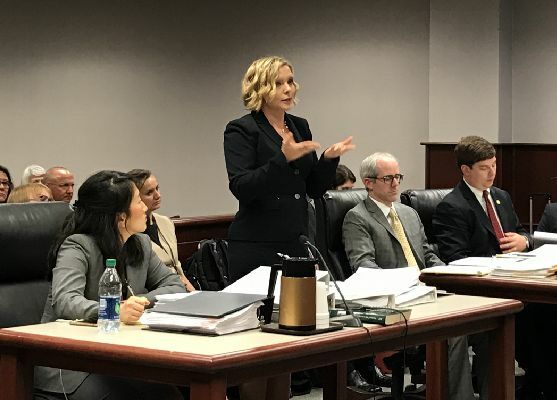 A three-judge panel ordered Wednesday that the State Board of Elections and Ethics Enforcement halt the ballot printing process until Sept. 1 or until such time they make a decision or an appellate court weighs in about two challenges over constitutional amendment language. Absentee voting is set to begin Sept. 7, but three weeks is the minimum amount of time needed to produce all ballot proofs, receive ballot approvals and print and deliver ballots, according to a letter sent to State Board Executive Director Kim Westbrook Strach. That means the process would have to begin Friday to meet that voting date, which isn’t set in stone. Federal law, however, requires absentee by-mail ballots to be made available by Sept. 22 or 45 days prior to the election. The Sept. 1 deadline in Wednesday’s order is the absolute latest date for the State Board to begin preparing ballots. The three-judge panel heard arguments in two lawsuits filed by Gov. Roy Cooper and the North Carolina NAACP and Clean Air Carolina, respectively. Cooper challenged the ballot questions over two constitutional amendments that interfere with the separation of powers, and the two organizations challenged the same two amendments, in addition to one requiring a photo identification to vote and another that caps the state income tax at seven percent. The order the judges agreed to enter after the hearings wasn’t meant to be a win for any parties to the lawsuits, but was a functional decision to allow the State Board and the judges some “breathing room.” Judge Forrest Bridges also pointed out that the order would save the state money in the event ballots were printed and a court decision was rendered that required them to be reprinted. He said he anticipated the panel would make a decision before Sept. 1. Martin Warf, an attorney representing House Speaker Tim Moore and Senate President Pro Tem Phil Berger, was dubious of the order and pointed out that it gave the plaintiffs in the cases the relief they sought. He didn’t argue further after the judges explained its necessity. Bridges is a registered Democrat serving Cleveland and Lincoln counties. 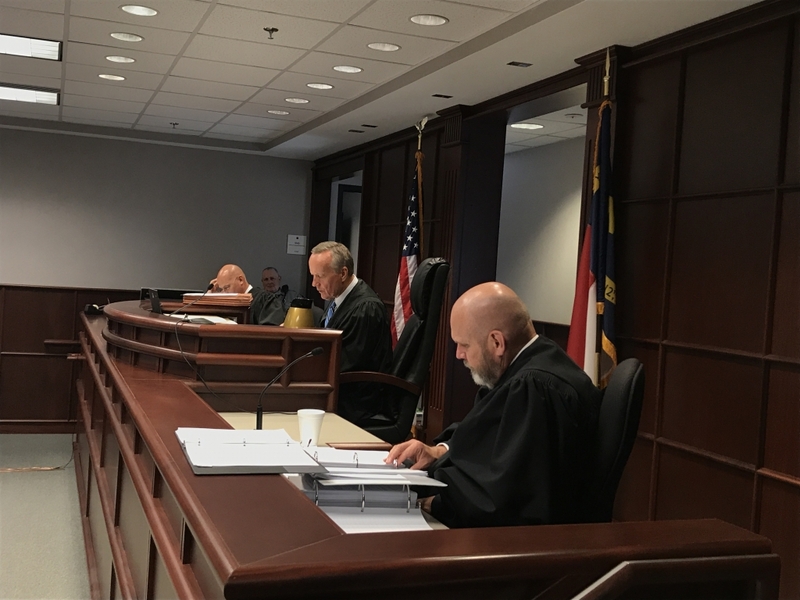 He was joined in presiding over the case by Judges Thomas H. Lock, who is registered to vote as an unaffiliated and serves Harnett, Johnston and Lee counties, and Jeffery K. Carpenter, a registered Republican who serves Union County. John “Buddy” Wester was one of three attorneys who represented Cooper. He told the judges that only the people of North Carolina had the power to amend the constitution but that the ballot language proposed by the General Assembly would “trick” them into doing so. Another of the Governor’s attorneys, Adam Doerr, went through each part of the ballot questions and two constitutional amendments to point out misleading language. Lock asked him how misleading ballot questions have to be before they violated the constitution and Doerr responded that lawmakers have a minimum obligation to explain amendments in such a way that voters understand the outcome. “If you want to seek the consent of the voters to amend the constitution, you must ask them and you must tell them what you are doing,” he said. Matt Sawchak, who represented the State Board and Chairman Andy Penry, said lawmakers not only have a constitutional requirement to meet but also a statutory one. He said the ballot items must not be partisan, colored, argumentative or in any way one-sided. 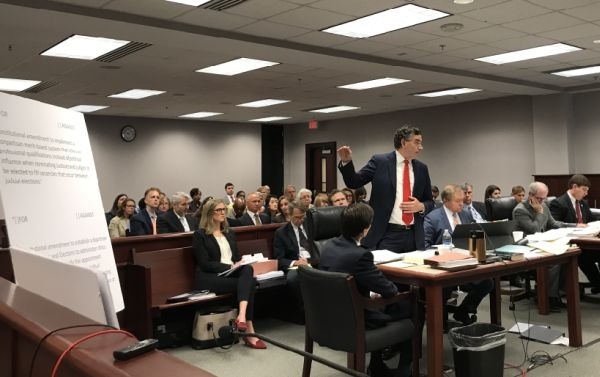 He told the judges there are seven million voters in North Carolina and many of them won’t have given the constitutional amendments any thought at all before stepping into the voter booth, which is why it was so important to not have misleading questions. “All they have to protect them, all we have to protect our constitution, is the ballot form itself,” he said. Warf argued the courts did not have the authority to pull constitutional amendments from the voters before they had a chance to weigh in at the ballot box. He said there was plenty of opportunity for public discourse and for voter education on the amendments and disagreed that the ballot language was misleading. He pointed out that a number of words in the ballot questions were taken from the constitutional amendments. “It’s not misleading when it’s in the ballot question and it’s in the amendment,” Warf said. He told the judges that there was more harm to be done by the judiciary if they intervene before the amendments are put before the voters than if they took the matters up after the election. Bridges asked Cooper’s attorneys and Sawchak to explain why judges shouldn’t wait until after the election to sort out the issues at hand. “Even if we agree that there are problems with the proposed language, why shouldn’t we simply sit back, let the election take place and then look at it afterwards?” he asked. Sawchak said that courts struggle mightily with post-balloting challenges because they are hesitant to undo the results. During rebuttal, he also said that intentionally misleading voters – as the State Board believes lawmakers are doing – makes voters pawns in an election scheme and sows discord. In the separate but similar case filed by the NAACP and Clean Air Carolina, Kym Hunter said she agreed with all of Cooper’s attorneys’ arguments and similarly went through the four amendments (the Governor only challenged two) in question to point out the reasons they were misleading. “There is wide bipartisan agreement throughout the state that there is misleading information,” she said, adding that the five former living North Carolina Governors filed in amicus brief in the case. Hunter went a step further than Cooper’s attorneys by asking the court to find that the General Assembly was illegally constituted and therefore could not propose constitutional amendments this election. 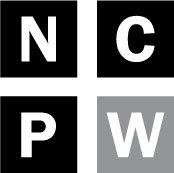 Hunter, who is an attorney with the Southern Environmental Law Center, said the people of North Carolina have been living under some of the worst racial gerrymanders in the nation for more than five years and that on the eve of a constitutional election, lawmakers proposed amendments to entrench their illegal power. 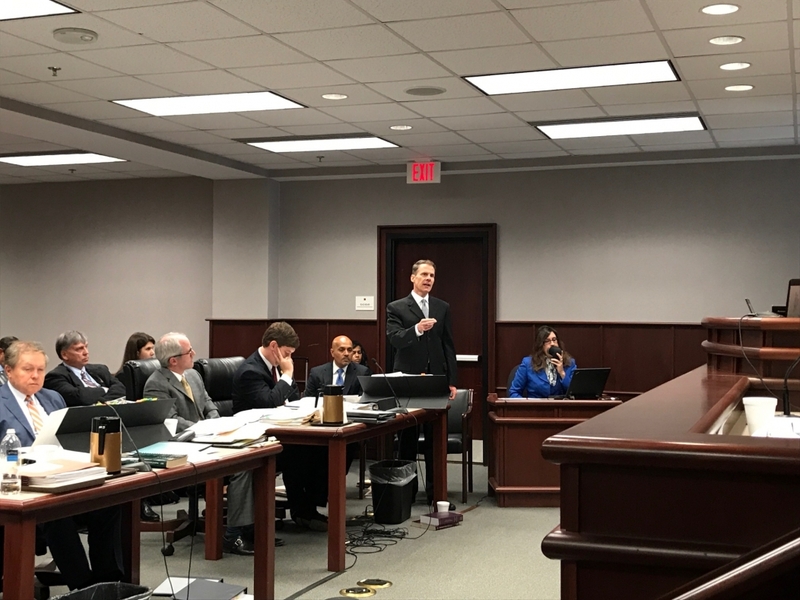 Matt Abee, another attorney for the legislature, told the judges that if they bought into Hunter’s “usurper” argument, it would be the “nuclear option” and they would nullify hundreds of laws. “What the plaintiffs are asking you to do would be unprecedented,” he said. Hunter accused him of using hyperbole and told the judges that they were only asking them specifically to address the usurper argument with respect to lawmakers’ roles in proposing constitutional amendments. “We understand that we’re asking for something extraordinary here but we believe it’s warranted,” she said. Warf made the same arguments as he did before for the most part. The judges took all arguments under advisement and commended all the attorneys involved for such quick, great work.